Bach Standard Series mouthpieces are some of the most popular mouthpieces in the world among both students and professionals. They are categorized from large to small diameters numerically, and from the deepest to the shallowest cup alphabetically. Model 1 Bach Standard Series mouthpieces are the largest cup diameter, and letter A cups are the deepest. Progressively smaller diameter cups are deliniated through number 20 and shallower cup depths are deliniated through letter F.Vincent Bach was a rare combination of artist and engineer. A mechanical genius and acclaimed trumpet soloist, his instruments and mouthpieces are used today in every major studio and orchestra in the world. Bach personally designed the tools and composed the plans that continue to set the high standards for making all Bach products today. 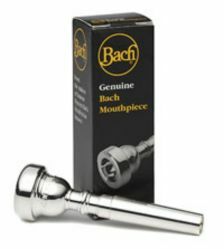 ****We offer the entire line of Bach mouthpieces. If you are looking for a specific size that is not listed here, please contact us! **** 7C / Medium / 16.20 mm / Medium wide, lowered toward the outside. Med. sharp inside edge. Well-rounded edge with a perfect grip. / Probably the most widely used model in the world. Its brilliant tone is preferred by school musicians and by artists.5C / Medium / 16.25 mm / Medium wide, well rounded toward the inside and outside, fairly flat. / For players with a strong embouchure who do not like a sharp edge. The tone is lively and rich.3C / Medium / 16.30 mm / Medium wide. / Fairly large cup, good for all-around use.3E / Shallow / 16.30 mm / Medium wide. / Preferred by players who want a large mouthpiece but with a shallow cup. Facilitates high register.1-1/2C / Medium / 17.00 mm / Medium wide, not too sharp. / Large diameter, medium cup — good for all-around use.